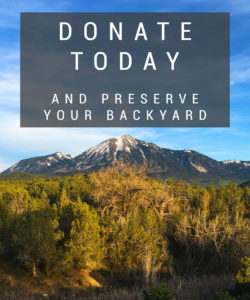 The Gunnison Public Lands Initiative (GPLI) is a coalition of community organizations that are committed to the incredible landscapes, recreation opportunities, and healthy habitats and wildlife of Gunnison County. As the GPLI advocates for congressional protection of our public lands, we support their efforts. GPLI has been careful, methodical, and inclusive in putting together their proposal. They have chosen areas that have strong community consensus behind them and will prove most beneficial to our communities in their natural state. The lands that they have proposed for protection include some of our most important places in the North Fork Valley. Mt. Lamborn is a central feature in our viewshed and the Muddy drainage and Pilot Knob is the source of our agricultural water. The Western Slope Conservation Center has been committed to the protection of public lands in the Lower Gunnison Watershed for 39 years. We work diligently to ensure that the communities of the Lower Gunnison Watershed have intact and functioning ecosystems, clean and abundant water, and well-managed lands with the highest level of protection they deserve. Because of this commitment and the thoughtful work of GPLI, the Conservation Center submitted a letter to Senator Bennet supporting GPLI and congressional protection of some of our most treasured places.